A review of the scientific literature by SPPI and CO2 Science finds increased CO2 increases agricultural crop resistance to drought and water-use efficiency, and decreases yield losses attributable to the uptake of aerial pollutants. As the air's CO2 content continues to rise, nearly all plants will respond by reducing their leaf stomatal apertures, through which water vapor exiting the leaf and carbon dioxide entering the leaf diffuse during transpiration and photosynthesis, respectively. This phenomenon typically leads to an increase in water use efficiency at elevated CO2 concentrations, because with more CO2 in the air, plants don't need to open their stomates as wide as they do at lower atmospheric CO2 concentrations to allow for sufficient inward diffusion of CO2 for use in photosynthesis. And as a consequence of this phenomenon, plants typically exhibit reductions in transpirational water loss, smaller yield losses attributable to the uptake of aerial pollutants, and increases in water-use efficiency. 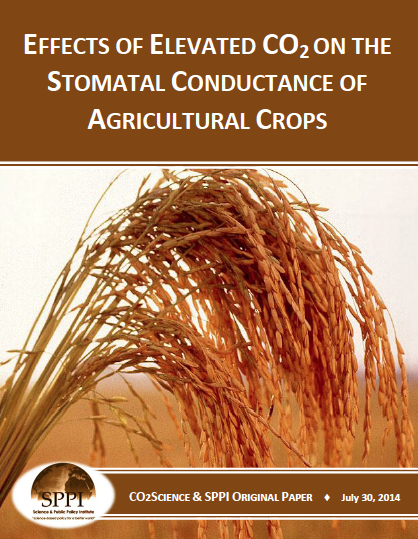 This summary document thus reviews some of the scientific literature pertaining to this important effect of elevated CO2 on the stomatal conductances of agricultural crops.